The Micad Appraisal module employs user defined templates to capture maintenance backlog and risks for your buildings. This flexible solution enables a wealth of building related surveys and risk assessments templates to be created including the NHS Risk based backlog methodology. Would you like to know why this product stands out? 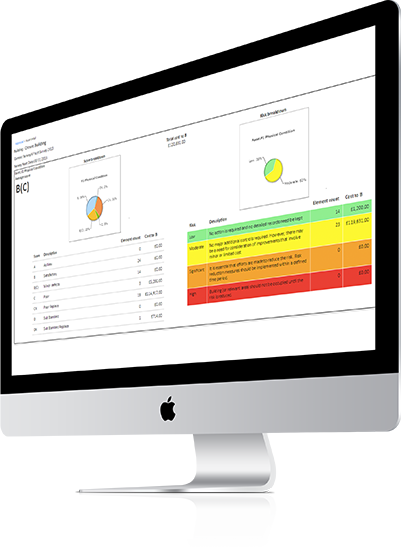 The powerful reporting suite from Micad provides dashboards, heat maps and defect analysis to help protect your business and estate related risks. The survey is just the beginning, the appraisal modules tracks changes in condition scores and the risk profile of your buildings whilst laying out the financial plan. Each survey becomes a live working document that logs defect resolution and updates. The flexibility of the software means you can grant access to different surveyors to manage their specialisms whilst keeping your organisation independent of your surveyor. Our Property Appraisal modules are available on request for demonstrations that are carried out by our expert team. Our demo service has been set up to ensure you’re using the software correctly and you’re getting the most out of the software. For more information get in touch with one of our team today.